The objective of CAMREX (Carbon in the Amazon River Experiment) project which was conducted from 1982 through 1991, was been to define by mass balances and direct measurements those processes which control the distribution of bioactive elements (C, N, P and O) in the mainstem of the Amazon River in Brazil. The CAMREX data set represents a time series unique in its length and detail for very large river systems. The central sampling strategy has been to obtain representative flux-weighted water samples for comprehensive chemical analysis and to make rate measurements over 18 different sites within a 2000 km reach of the Brazilian Amazon mainstem, including major intervening tributaries. Samples have now been collected on 13 different cruises (1982-1991) during contrasting hydrographic stages. Data or images are provided for (1) water chemistry, (2) daily river discharge, (3) images (.jpgs) of monthly estimates for 1989 of some model drivers and structure including NPP, Evapotranspiration, Precipitation, Temperature, and AVHRR data, (4) daily precipitation, and (5) air temperature anomalies. The processed, quality controlled and integrated data in the documented Pre-LBA Data sets were originally published as a set of three CD_ROMs (Marengo and Vistoria, 1998) but are now archived individually. The data set compilation efforts included satellite imagery, micrometeorological observations, near surface and upper-air atmospheric conditions, surface biophysical and hydrological measurements obtained from 1970's-1990's in a number of field experiments. Data were collected for several intensive field campaigns, during the rainy and dry seasons, and other periods that vary from short intensive field campaigns to several years worth of observations, measured sometimes with a time resolution of 5 minutes and 1 hour. Richey, J.E., R L. Victoria, J.I. Hedges, T. Dunne, L.A. Martinelli, L. Mertes, and J. Adams. 2008. Pre-LBA Carbon in the Amazon River Experiment (CAMREX) Data. Data set. Available on-line [http://daac.ornl.gov] from Oak Ridge National Laboratory Distributed Active Archive Center, Oak Ridge, Tennessee, U.S.A. doi:10.3334/ORNLDAAC/904. Data or images are provided for (1) water chemistry, (2) daily river discharge, (3) monthly estimates for 1989 of some model drivers and structure including NPP, Evapotranspiration, Precipitation, Temperature, and AVHRR data, (4) daily precipitation, and (5) air temperature anomalies. The river water chemistry data assembled here were collected on a series of research cruise expeditions on the LM AMANAI (INPA, Manaus), between 1982 and 1991, as part of the "CAMREX" project. "CAMREX" is a joint project of the Unversity of Washington (Seattle), CENA-USP (Piracicaba), and INPA, financed by Brazilian resources, the US National Science Foundation, and NASA. The data reported here have been the basis for the papers cited under "Publications." Table 1 identifies the parameters reported, and brief references for methodologies. Table 2 identifies the sampling stations, their respective coordinates, and (thalweg) distances between stations. Table 3 contains the basic data grouped by cruise number; "jd" is the julian date of the collection, dating from 1 January 1982. This data set includes calculations of daily discharge (cubic meters per second; m3/s) at the stations indicated, derived from the stage data of DNAEE. The calculations are based on rating curves (conversions of stage-river- height to river flow) derived from specific CAMREX measurements combined with DNAEE rating data. The methods are described in Richey et al. (1989). Example records from the discharge data file, DISCHARGE.csv. The overall objective of the modeling component of CAMREX group work is to examine seasonal and interannual changes in regional-scale patterns of Potential net primary productivity (NPP) in the Amazon. Ideally, such an analysis would rely on long-term, extensive field networks. In practice, it is necesasary to use models and remote sensing with only sparse field information. We have adapted a global-scale model of biogeochemistry, CASA (Potter et al. 1993), to the Amazon as a regional case study. To assess these variables, we have accumulated in a GIS environment high-resolution gridded data sets of the variables required to apply CASA to the Amazon Basin at a resolution of 0.05 degrees. The model was driven with standard monthly data sets of precipitation, air temperature and calculated evapotranspiration and with NDVI obtained from the Pathfinder 5 km AVHRR data set as a scalar for LAI assigned by broad vegetation classes. The group has explored the potential seasonality of net primary production in the Amazon Basin over the last decade. This period was chosen because of data availability, occurrence of different annual climatic regimes, and because it covers a period of basin change. If verified, this model run would constitute a baseline against which to monitor future change. This work is being undertaken with the expectation that the upcoming LBA Study will provide an unparalleled opportunity for field verification, while the modeling activity in turn would be a useful synthesis tool and a means to identify key problems and regions for the study. In this data set are provided .jpg images of the monthly estimates for 1989 of some of the model drivers and structure. All images are contained in the single compressed file, MODEL_IMAGES.zip. Daily precipitation values in mm are provided for selected sites across the LBA study area over the period 1970-1992. The data file names contain a code given by the national water agency from Brazil's Agencia Nacional de Aguas (ANA) for each long term monitoring site. Coordinates and additional site information are available at on the ANA's web site (www.ana.gov.br) through the Sistema de Informacoes Hidrologicas. Files of daily precipitation data in mm are provided for the selected stations for the indicated years. All data files are contained in the single compressed file, RAIN.zip. 00048000 = 8 character site code. Use in ANA's Sistema de Informacoes Hidrologicas to search for site information. Example data records from data file, d00048000.70. The anomalies data assembled here are the monthly average surface air temperature anomalies records from 17 stations in the Brazilian Amazon from 1913 to 1995, converted into temperature anomalies, as the differences between annual mean temperatures and the mean temperature of a reference period (1958-1985) (Victoria et al., 1998). Air temperature anomaly data for equatorial and nonequatorial stations are in separate .csv files, anom-eq.csv and anom-noneq.csv, respectively. Stations, location, period covered by the data set, and interruptions in the records of air surface temperature measuring stations. Example data records for equatorial stations, anon-eq.csv. Units are degrees C. Missing values are -9.99999. Example data records for non-equatorial stations, anom-noneq.csv. Units are degrees C. Missing values are -9.99999. How are biogeochemical signatures of the river system imparted by aggregated land surfaces, and at what rates and scales? How are the signatures of land-derived and in-situ processes modified during transit through the river system? What role does the evasion (outgassing) of CO2 from the river system to the atmosphere play in the carbon cycle of moist tropical forests? Our overall perspective in CAMREX is that the Amazon is a test case for developing extendable models of how hydrologic and biogeochemical cycles are coupled at regional to continental scales in the humid tropics. Our studies serve the dual purposes of gaining a broad mechanistic understanding, and of establishing data baselines needed to assess anthropogenic perturbations to these globally critical and ecologically complex systems. As documented in over 100 publications, the resulting CAMREX dataset represents a time series unique in its length and detail for very large river systems. Our studies serve the dual purposes of gaining a broad mechanistic understanding of large river networks, and of establishing data baselines needed to assess future anthropogenic perturbations to these globally critical and ecologically complex systems. Funded primarily by the US NSF and NASA and Brazilian FAPESP, CAMREX is a joint project of the University of Washington (UW, Seattle) and the Centro de Energia Nuclear na Agricultura (CENA, Piracicaba), with colleagues at the Instituto Nacional de Pesquisas da Amazonia and other Brazilian and U.S. institutions. The Sampling Network "Rede Beija Rio"
Our experimental plan is predicated on a systematic collection of a common set of parameters across representative environments in the Amazon. Because of the far-flung and remote nature of the Amazon, the logistics of establishing an encompassing sampling network are considerable. It is simply not feasible to send out a team from a central university or laboratory, and expect it to collect data with sufficient resolution. Rather, our strategy has been to develop a network we call "Rede Beija-Rio" ("The Network of Kiss-the-River,") a play on words of the Portuguese word for hummingbird, Beija-Flor). The objective is to establish a set of sites across the basin, organized as transects based out of specific locations (nodes). A key element in our strategy is that each node is occupied by a researcher or a team of researchers, from that site. Typically these will be undergraduate and/or graduate students from local institutions (usually regional universities). This serves the dual purpose of being able to conduct much higher frequency (and much less expensive) sampling than sending teams from Sao Paulo or Seattle), and it provides training and capacity building. Implicit in this strategy is that each node has at least some degree of logistical support and access. Resulting of this sampling network are then integrated with modeling to produce the spatially-explicit and dynamical understanding needed to answer our lead questions. At this point, we have established a set of sampling sites, operating out of bases (nodes) in Manaus, Belem, Palmas, Santarem, Rio Branco, Ji-Parana, Alta Floresta, and Juruena (and we are working to establish several more). The primary nodes, or bases, that form the Rede are shown. Each node is staffed by individuals from local institutions, and/or by colleagues from CENA, the UW, or other institutions. Each node then is responsible for a regional sampling (click on each, for detail). Extensive surveys (bi-weekly sampling): involving the identification of the spatial pCO2 variability by habitat type, in the largest possible range of environments. This sites were chosen in areas already studied within the Large Scale Biosphere-Atmosphere Experiment in the Amazon (LBA Project), based on ongoing or under implementation cooperation with local scientific and/or educational institutions. Intensive studies (sampling of rainfall events on time-scales as detailed as minutes): involving detailed studies of patterns and processes at the micro and meso-scale, at a selected smaller number of sites, as a function of the proximity to laboratories and existence of specialized personnel. Richey, J. E., C. Nobre and C. Deser. 1989. Amazon river discharge and climate variability: 1903 to 1985. Science 246:101-103. DOI: 10.1126/science.246.4926.101. Richey, J. E., L. A. K. Mertes, T. Dunne, R. L. Victoria, B. R. Forsberg, A. C. M. S. Tancredi and E. Oliveira. 1989. Sources and routing of the Amazon River flood wave. Global Biogeochemical Cycles 3:191-204. Victoria, R. L., L. A. Martinelli, J. M. Moraes, M. V. Ballester, and A. V. Krusche. 1998. Surface air temperature in the Amazon region and its borders during this century, J. Clim., 11, 1105-1110. DOI: 10.1175/1520-0442(1998)011<1105:SATVIT>2.0.CO;2. Publications of the Carbon in the Amazon River Experiment (CAMREX) School of Oceanography, University of Washington Jeffrey E. Richey, Principal Investigator. (1) Richey, J. E., J. T. Brock, R. J. Naiman, R. C. Wissmar and R. F. Stallard. 1980. Organic carbon: oxidation and transport in the Amazon River. Science 207:1348-1351. (2) Wissmar, R. C., J. E. Richey, R. F. Stallard and J. M. Edmond. 1981. Plankton metabolism and carbon processes in the Amazon River, its tributaries, and floodplain waters, Peru-Brazil, May-June 1977. Ecology 62:1622-1633. (2a) Richey, J. E. 1981. Particulate and dissolved carbon in the Amazon River: a preliminary annual budget. Verh. Int. Verein. Limnol. 21:914-917. (3) Richey, J. E. 1981. Fluxes of organic matter in rivers relative to the global carbon cycle. In: Flux of organic carbon by rivers to the oceans, edited by G. Likens, F. Mackenzie, J. Richey, J. Sedell and K. Turekian, pp. 270-283. Dept. of Energy Conf-8009140, UC-11, Washington, DC. (4) Richey, J. E. 1982. The Amazon River system: A biogeochemical model. Mitt. Geol-Palaont. Inst. 52:365-378. (5) Richey, J. E. 1983. Interactions of C, N, P, and S in river systems: a biogeochemical model. In: The major biogeochemical cycles and their interactions, edited by B. Bolin and R. B. Cook, pp. 365-383. John Wiley and Sons, New York. (6) Richey, J. E. 1983. The phosphorus cycle. In: The major biogeochemical cycles and their interactions, edited by B. Bolin and R. B. Cook, pp. 51-56. John Wiley and Sons, New York. (7) Meade, R. H., T. Dunne, J. E. Richey, U. M. Santos and E. Salati. 1985. Storage and remobilization of sediment in the lower Amazon River of Brazil. Science 228:488-490. (7a) Devol, A. H., A. dos Santos, B. R. Forsberg and T. M. Zaret. 1984. Nutrient addition experiments in Lago Jacaretinga, central Amazon, Brazil: 2. The effect of humic and fulvic acids. Hydrobiologia 109:97-103. (8) Richey, J. E., E. Salati and U. dos Santos. 1985. Biogeochemistry of the Amazon River: An update. Mitt. Geol-Palaont. Inst. 58:245-257. (9) Richey, J. E., R. H. Meade, E. Salati, A. H. Devol, C. F. Nordin Jr. and U. dos Santos. 1986. Water discharge and suspended sediment concentrations in the Amazon River: 1982-1984. Water Resources Research 22:756-764. (10) Subramanian, V., J. E. Richey and N. Abbas. 1985. Preliminary studies on the particulate C and N in the Ganges-Brahmaputra river system. Mitt. Geol-Palaont. Inst. 58:513-518. (11) Richey, J. E. and M. N. G. Ribeiro. 1987. Element cycling in the Amazon basin: a riverine perspective. In: The geophysiology of Amazonia, edited by R. E. Dickinson, pp. 245-250. John Wiley and Sons, New York. (12) Hedges, J. I., J. R. Ertel, P. D. Quay, P. M. Grootes, J. E. Richey, A. H. Devol, G. W. Farwell, F. W. Schmidt and E. Salati. 1986. Organic carbon-14 in the Amazon River system. Science 231:1129-1131. (13) Hedges, J. I., W. A. Clark, P. D. Quay, J. E. Richey, A. H. Devol and U. d. M. Santos. 1986. Compositions and fluxes of particulate organic material in the Amazon River. Limnology and Oceanography 31:717-738. (14) Ertel, J. R., J. I. Hedges, A. H. Devol and J. E. Richey. 1986. Dissolved humic substances of the Amazon River system. Limnology and Oceanography 31:739-754. (15) Devol, A. H., P. D. Quay, J. E. Richey and L. A. Martinelli. 1987. The role of gas exchange in the inorganic carbon, oxygen and 222radon budgets of the Amazon River. Limnology and Oceanography 32:235-248. (16) Araujo-Lima, C. A. R. M., B. R. Forsberg, R. Victoria and L. Martinelli. 1986. Energy sources for detritivorous fishes in the Amazon. Science 234:1256-1258. (17) Martinelli, L. A., J. R. Ferreira, R. L. Victoria, J. Mortatti, B. R. Forsberg, J. A. Bonassi, E. Oliveira and A. C. Tancredi. 1988. Fluxo de nutrientes em alguns rios do Estado de Rondonia, Bacia do Rio Madeira. Acta Limnologica Brasiliense 11:911-930. (18) Martinelli, L. A., R. L. Victoria, E. Matsui, B. R. Forsberg and A. A. Mozeto. 1988. Utilizacao das variacoes naturais de d13C no estudos de cadeias alimentares em ambientes aquaticos: Principios e perspectivas. Acta Limnologica Brasiliense 11:859-882. (19) Martinelli, L. A., J. R. Ferreira, B. R. Forsberg and R. L. Victoria. 1988. Mercury contamination in the Amazon: a gold rush consequence. Ambio 17:252-254. (20) Richey, J. E., A. H. Devol, S. C. Wofsy, R. Victoria and M. N. G. Ribeiro. 1988. Biogenic gases and the oxidation and reduction of carbon in the Amazon River and floodplain waters. Limnology and Oceanography 33:551-561. (21) Devol, A. H., J. E. Richey, W. A. Clark, S. L. King and L. A. Martinelli. 1988. Methane emissions to the troposphere from the Amazon floodplain. Journal of Geophysical Research 95:1583-1592. (22) Forsberg, B. R., A. H. Devol, J. E. Richey, L. A. Martinelli and H. dos Santos. 1988. Factors controlling nutrient concentrations in Amazon floodplain lakes. Limnology and Oceanography 33:41-56. (23) Martinelli, L. A., B. R. Forsberg, R. L. Victoria, J. E. Richey, A. H. Devol and J. Mortatti. 1988. Sediment load in the Madeira River. Mitt. Geol-Palaont. Inst. 68:41-54. (24) Ferreira, J. R., A. H. Devol, L. A. Martinelli, B. R. Forsberg, R. L. Victoria, J. E. Richey and J. Mortatti. 1988. Chemical composition of the Madeira River: Seasonal trends and total transport. Mitt. Geol-Palaont. Inst. 66:63-75. (25) Sedell, J. R., J. E. Richey and F. J. Swanson. 1989. The river continuum concept: A basis for the expected ecosystem behavior of very large rivers? In: Proceedings of the international large river symposium, edited by D. P. Dodge, pp. 49-55. (26) Martinelli, L. A., R. L. Victoria, E. Matsui, J. E. Richey, B. R. Forsberg and J. Mortatti. 1987. The use of oxygen isotopic composition to study water dynamics in Amazon floodplain lakes. Proceedings, Regional seminar for Latin America on the use of isotopic techniques in hydrology, Nuclear Investigation Centre, Salazar, Mexico, pp. 91-100. International Atomic Energy Agency, Vienna. (27) Quay, P., S. King, D. Wilbur, S. Wofsy and J. Richey. 1989. 13C/12C of atmospheric CO2 in the Amazon Basin: forest and river sources. Journal of Geophysical Research 94:18327-18336. (28) Richey, J. E., L. A. K. Mertes, T. Dunne, R. L. Victoria, B. R. Forsberg, A. C. M. S. Tancredi and E. Oliveira. 1989. Sources and routing of the Amazon River flood wave. Global Biogeochemical Cycles 3:191-204. (29) Victoria, R. L., L. A. Martinelli, J. E. Richey, A. H. Devol, B. R. Forsberg and M. N. G. Ribeiro. 1989. Spatial and temporal variations in soil chemistry on the Amazon floodplain. GeoJournal 19:45-52. (30) Richey, J. E., J. B. Adams and R. L. Victoria. 1990. Synoptic-scale hydrological and biogeochemical cycles in the Amazon River basin: A modeling and remote sensing perspective. In: Remote sensing of biosphere functioning, edited by R. J. Hobbs and H. A. Mooney, pp. 249-268. Springer-Verlag, New York. (31) Richey, J. E., C. Nobre and C. Deser. 1989. Amazon river discharge and climate variability: 1903 to 1985. Science 246:101-103. (32) Richey, J. E., J. I. Hedges, A. H. Devol, P. D. Quay, R. Victoria, L. Martinelli and B. R. Forsberg. 1990. Biogeochemistry of carbon in the Amazon River. Limnology and Oceanography 35:352-371. (33) Quay, P. D., S. L. King, J. M. Lansdown and D. O. Wilbur. 1988. Isotopic composition of methane released from wetlands: Implications for the increase in atmospheric methane. Global Biogeochemical Cycles 2:385-397. (34) Devol, A. H., J. E. Richey, B. R. Forsberg and L. A. Martinelli. 1990. Seasonal dynamics in methane emissions from the Amazon River floodplain to the troposphere. Journal of Geophysical Research 95D:16417-16426. (35) Salati, E., R. L. Victoria, L. A. Martinelli and J. E. Richey. 1989. Deforestation and its role in possible changes in the Brazilian Amazon. In: Global Change and Our Common Future: Papers from a Forum, edited by R. S. DeFries and T. F. Malone, pp. 159-171. National Academy Press, Washington, D.C.
(36) Salati, E., R. L. Victoria, L. A. Martinelli and N. A. Villa Nova. 1989. Soil, water, and climate of Amazonia: an overview. Proceedings, Amazon: Facts, Problems, and Solutions, pp. 300-354. Universidade de Sao Paulo. (37) Forsberg, B. R., J. M. Godoy, R. L. Victoria and L. A. Martinelli. 1989. Development and erosion in the Brazilian Amazon: a geochronological case study. GeoJournal 19:402-405. (38) Martinelli, L. A., R. L. Victoria, A. H. Devol, J. E. Richey and B. R. Forsberg. 1989. Suspended sediment load in the Amazon basin: An overview. GeoJournal 19:381-389. (39) Victoria, R. L., L. A. Martinelli, P. C. O. Trivelin, E. Matsui, B. R. Forsberg, J. E. Richey and A. H. Devol. 1992. The use of stable isotopes in studies of nutrient cycling: Carbon isotope composition of Amazon varzea sediments. Biotropica 24:240-249. (40) Devol, A. H., J. E. Richey and B. R. Forsberg. 1991. Phosphorus in the Amazon River mainstem: Concentrations, forms and transport to the oceans. In: Phosphorus cycles in terrestrial and aquatic ecosystems, Regional Workshop 3: South and Central America, edited by H. Tiessen, D. Lopez-Hernandez and I. H. Salcedo, pp. 9-23. SCOPE/Saskatchewan Institute of Pedology, Saskatoon, Sask. (41) Johnsson, M. J. and R. H. Meade. 1990. Chemical weathering of fluvial sediments during alluvial storage: The Macuapanim Island point bar, Solimoes River, Brazil. Journal of Sedimentary Petrology 60:827-842. (42) Forsberg, B. R., T. P. Pimental and A. D. Nobre. 1991. Photosynthetic parameters for phytoplankton in Amazon floodplain lakes, April-May 1987. Verh. Int. Verein. Limnol. 24:1188-1191. (43) Devol, A. H., J. E. Richey, S. L. King, J. Lansdown and L. A. Martinelli. 1996. Seasonal variations in the 13C-CH4 of Amazon floodplain waters. Verh. Int. Verein. Limnol. 25:173-178. (44) Richey, J. E., R. L. Victoria, E. Salati and B. R. Forsberg. 1991. The biogeochemistry of a major river system: The Amazon case study. In: Biogeochemistry of major world rivers, edited by E. T. Degens, S. Kempe and J. E. Richey, pp. 57-74. John Wiley and Sons, New York. (45) Degens, E. T., S. Kempe and J. E. Richey. 1991. Summary: Biogeochemistry of major world rivers. In: Biogeochemistry of major world rivers, edited by E. T. Degens, S. Kempe and J. E. Richey, pp. 323-347. John Wiley and Sons, New York. (46) Degens,E. T., S. Kempe and J. E. Richey. 1991. Biogeochemistry of major world rivers. John Wiley and Sons, London, 356 pp. (47) Bartlett, K. B., P. M. Crill, J. A. Bonassi, J. E. Richey and R. C. Harriss. 1990. Methane flux from the Amazon River floodplain: Emissions during rising water. Journal of Geophysical Research 95:16773-16788. (48) Meade, R. H., J. M. Rayol, S. C. Da Conceicao and J. R. G. Natividade. 1991. Backwater effects in the Amazon River basin of Brazil. Environmental Geology and Water Science 18:105-114. (49) Quay, P. D., D. O. Wilbur, J. E. Richey, J. I. Hedges, A. H. Devol and R. L. Victoria. 1992. Carbon cycling in the Amazon River: Implications from the 13C composition of particles and solutes. Limnology and Oceanography 37:857-871. (51) Salati, E., R. L. Victoria, L. A. Martinelli and J. E. Richey. 1991. Forests: Their role in global change, with special reference to the Brazilian Amazon. Proceedings, Second World Climate Conference, pp. 391-395. Cambridge University Press. (52) Richey, J. E. and R. L. Victoria. 1993. C, N, and P export dynamics in the Amazon River. In: Interactions of C, N, P, and S biogeochemical cycles and global change, edited by R. Wollast, F. T. Mackenzie and L. Chou, pp. 123-140. Springer-Verlag, Berlin. (53) Victoria, R. L., L. A. Martinelli, J. Mortatti and J. Richey. 1991. Mechanisms of water recycling in the Amazon Basin: Isotopic insights. Ambio 20:384-387. (54) Martinelli, L. A., A. H. Devol, R. L. Victoria and J. E. Richey. 1991. Stable carbon isotopic variation in C3 and C4 plants along the Amazon River. Nature 353:57-59. (55) Martinelli, L. A., R. L. Victoria, P. C. O. Trivelin, A. H. Devol and J. E. Richey. 1992. 15N natural abundance in plants of the Amazon River floodplain and potential atmospheric N2 fixation. Oecologica 90:591-596. (56) Forsberg, B. R., C. A. R. M. Araujo-Lima, L. A. Martinelli, R. L. Victoria and J. A. Bonassi. 1992. Autotrophic carbon sources for fish of the central Amazon. Ecology 74:643-652. (57) Hedges, J. I., P. G. Hatcher, J. R. Ertel and K. J. Meyers-Schulte. 1992. A comparison of dissolved humic substances from seawater with Amazon River counterparts by 13C-NMR spectrometry. Geochimica et Cosmochimica Acta 56:1753-1757. (58) Benner, R. and J. I. Hedges. 1993. A test of the accuracy of freshwater DOC measurements by high-temperature catalytic oxidation and UV-promoted persulfate oxidation. Marine Chemistry 41:161-165. (59) Martinelli, L. A., R. L. Victoria, J. E. Richey, J. Mortatti and A. H. Devol. 1993. The Amazon basin: Deforestation and CO2 emissions. In: Global warming: Concern for Tomorrow, edited by D. Lal, pp. 174-195. Tata McGraw-Hill, New Delhi, India. (60) Mertes, L. A. K., M. O. Smith and J. B. Adams. 1993. Estimating suspended sediment concentrations in surface waters of the Amazon River wetlands from Landsat images. Remote Sensing of the Environment 43:281-301. (61) Forsberg, B. R. 1992. Mercury contamination in the Amazon: Another Minamata? Water Report 2:6-8. (62) Martinelli, L. A., R. L. Victoria, J. L. I. Dematte, J. E. Richey and A. H. Devol. 1993. Chemical and mineralogical composition of Amazon River floodplain sediments, Brazil. Applied Geochemistry 8:391-402. (63) Mertes, L. A. K. 1994. Rates of flood-plain sedimentation on the central Amazon River. Geology 22:171-174. (64) Hedges, J. I., G. L. Cowie, J. E. Richey, P. D. Quay, R. Benner and M. Strom. 1994. Origins and processing of organic matter in the Amazon River as indicated by carbohydrates and amino acids. Limnology and Oceanography 39:743-761. (65) Meade, R. H.. 1994. Suspended sediments of the modern Amazon and Orinoco Rivers. Quaternary International 21:29-39. (66) McClain, M. E., J. E. Richey and T. P. Pimentel. 1994. Groundwater nitrogen dynamics at the terrestrial-lotic interface of a small catchment in the Central Amazon Basin. Biogeochemistry 27:113-127. (67) Devol, A. H., J. E. Richey, B. R. Forsberg and L. A. Martinelli. 1994. Environmental methane in the Amazon river floodplain. In: Global Wetlands, edited by W. J. Mitsch, pp. 151-165. Elsevier, The Netherlands. (68) Forsberg, B. R., C. A. R. M. Araujo-Lima, C. R. Padovani, R. L. Victoria, L. A. Martinelli, J. M. Fernandez and J. E. Richey. 1992. Teias energeticas aquaticas da Amazonia central. Proceedings, II Congresso Latino-Americano de Ecologia/I Congresso Brasileiro de Ecologia, Caxambu, MG.
(69) Mertes, L. A. K., D. Daniel, J. Melack, B. Nelson, L. Martinelli and B. Forsberg. 1995. Spatial patterns of hydrology, geomorphology, and vegetation on the floodplain of the Amazon River in Brazil. Geomorphology 13:215-232. (70) Quay, P. D., D. O. Wilbur, J. E. Richey, A. H. Devol, R. Benner and B. R. Forsberg. 1995. The 18O/16O of dissolved oxygen in rivers and lakes in the Amazon Basin: a tracer of respiration and photosynthesis. Limnology and Oceanography 40:718-729. (71) Martinelli, L. A., R. L. Victoria, B. R. Forsberg, and J. E. Richey. 1994. Isotopic composition of major carbon reservoirs in the Amazon floodplain. International Journal of Ecology and Environmental Sciences 20:31-46. (72) Benner, R., S. Opsahl, G. Chin-Leo, J. E. Richey and B. R. Forsberg. 1995. Bacterial carbon metabolism in the Amazon River system. Limnology and Oceanography 40:1262-1270. (73) Devol, A. H., B. R. Forsberg, J. E. Richey and T. P. Pimentel. 1995. Seasonal variation in chemical distributions in the Amazon (Solimões) River: a multiyear time series. Global Biogeochemical Cycles 9:307-328. (74) McClain, M. E. and J. E. Richey. 1996. Regional-scale linkages of terrestrial and lotic ecosystems in the Amazon basin: A conceptual model for organic matter. Archiv fur Hydrobiologie (Suppl. 113) 111-125. (75) Richey, J. E., E. Salati, R. L. Victoria, and L. A. Martinelli. 1995. Tropical water resource management: the biophysical basis. In: Defining and Measuring Sustainability: The Biogeophysical Foundation, M. Munasinghe and W. Shearer, eds., pp. 407-428. Washington, D.C.: United Nations University and World Bank. (76) McClain, M. E., J. E. Richey, and R. L. Victoria. 1996. 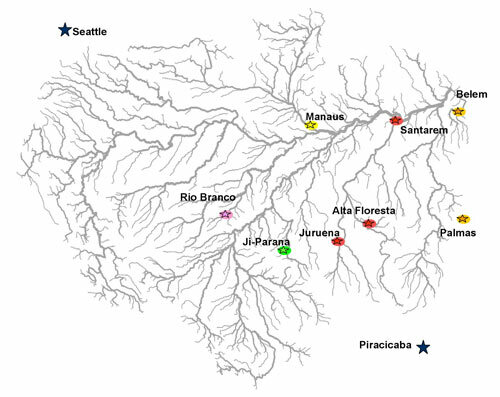 Andean contributions to the biogeochemistry of the Amazon River system. Bulletin de l'Institut Francais d'Etudes Andines 24:425-437. (77) Amon, R. and R. Benner. 1996. Bacterial utilization of different size classes of dissolved organic matter. Limnology and Oceanography 41:41-51. (78) Martinelli, L. A., R. L. Victoria, L. S. L. Sternberg, A. Ribeiro, and M. Z. Moreira. 1996. Using stable isotopes to determine sources of evaporated water to the atmosphere in the Amazon Basin. Journal of Hydrology 183:191-204. (79) Mertes, L. A. K., T. Dunne, and L. A. Martinelli. 1996. Channel-floodplain geomorphology of the Solimoes-Amazon River, Brazil. Geological Society of America Bulletin 108:1089-1107. (80) Brandes, J. A., M. E. McClain, and T. P. Pimentel. 1996. 15N evidence for the origin and cycling of inorganic nitrogen in a small Amazonian catchment. Biogeochemistry 34:45-56. (81) Amon, R. M. W. and R. Benner. 1996. Photochemical and microbial consumption of dissolved organic carbon and dissolved oxygen in the Amazon River system. Geochimica et Cosmochimica Acta 60:1783-1792. (82) Richey, J. E. and R. L. Victoria. 1996. Continental-scale biogeochemical cycles of the Amazon River system. Verh. Int. Verein. Limnol. 26:219-226. (83) Waichman, A. V. 1996. Autotrophic carbon sources for heterotrophic bacterioplankton in a floodplain lake of the Central Amazon. Hydrobiologia 341:27-36. (84) Richey, J. E., S. R. Wilhelm, M. E. McClain, R. L. Victoria, J. M. Melack, and C. A. R. M. Araujo-Lima. 1997. Organic matter and nutrient dynamics in river corridors of the Amazon Basin and their response to anthropogenic change. Ciencia e Cultura 49:98-110. (85) Mertes, L.A.K. 1997. Documentation and significance of the perirheic zone on inundated floodplains. Water Resources Research 33:1749-1762. (86) McClain, M. E., J. E. Richey, J. A. Brandes, and T. P. Pimentel. 1997. Dissolved organic matter and terrestrial-lotic linkages in the central Amazon Basin, Brazil. Global Biogeochemical Cycles 11:295-311. (87) Dunne, T., L. A. K. Mertes, R. H. Meade and J. E. Richey, and B. R. Forsberg. In press. Sediment exchange between the channel and floodplain of the Amazon River. Geological Society of America Bulletin. (88) Hedges, J. I., R. Benner, and R. G. Keil. In press. The fate of terrigenous organic matter in the oceans. Organic Geochemistry. (89) Keil, R. G., L. M. Mayer, P. D. Quay, J. E. Richey and J. I. Hedges. 1997. Loss of organic matter from riverine particles in deltas. Geochimica et Cosmochimica Acta 61: 1507-1511. (90) Martinelli, L. A., L. C. R. Pessenda, E. Espinoza, P. B. Camargo, E. C. Telles, C. C. Cerri, R. L. Victoria, R. Aravena, J. E. Richey, and S. Trumbore. 1996. Carbon-13 variation with depth in soils of Brazil and climate changes during the quaternary. Oecologia 106:376-381. (91) Hedges, J. I. and R. G. Keil. In press. Organic geochemical perspectives on estuarine processes: sorption reactions and consequences. Marine Chemistry. (100) Mertes, L. A. K. 1985. Floodplain development and sediment transport in the Solimões-Amazon River, Brazil. Master's thesis, University of Washington. (101) Martinelli, L. A. 1986. Composicao quimica e isotopica (13C) de sedimentos de varzea e suas interacoes com alguns rios da bacia Amazonica. Master's thesis, Universidade de Sao Paulo at Piricicaba. (102) Martinelli, L. A. 1989. Variabilidade espacial da composicao quimica, mineralogica e organica da carga de sedimento depositada nas planicies de inundacao de alguns rios da Amazonia. Doctoral thesis, Universidade de Sao Paulo at Piricicaba. (103) Piccolo, M. C. 1989. Dinamica do nitrogeno incorporado na forma organica em solos de varzea e terra firme na Amazonia central. Master's thesis, Universidade de São Paulo at Piricicaba. (104) Mertes, L. A. K. 1990. Hydrology, hydraulics, sediment transport, and geomorphology of the central Amazon floodplain. Doctoral thesis, University of Washington. (105) Padovani, C. R. 1992. Determinacao das fontes autotroficas de carbono para camaroes em um lago de várzea da Amazonia central, utilizando isotopos estaveis de carbono. Master's thesis, INPA/FUA. (106) Fernandez, J. M. 1993. Fontes autotrophicas de energia em alevinos de jaraqui Semaprochilodus insignis (Schomburgki, 1841) e curimata Prochilodus nigricans (Agassiz, 1829 (Pisces: Prochilodontidae)) na Amazonia central. Master's thesis, INPA/FUA. (107) Waichman, A. V. 1995. Autotrophic carbon sources for bacteria in a "varzea" lake of Central Amazon. Master's thesis, INPA/FUA. (108) Pinheiro, P. 1996. Fracionamento, caracterizacao, e dinamica do fosforo dissolvido em alguns ambientes aquaticos da Amazonia. Doctoral thesis, INPA/FUA. (109) McClain, M.E. 1996. Terrestrial controls on the biogeochemistry of dissolved organic matter and inorganic nitrogen in streams of the central Amazon Basin, Brazil. Doctoral thesis, University of Washington. For reprints of any of the published articles, please contact Sherry Wilhelm, School of Oceanography, University of Washington, Box 357940, Seattle, WA 98195-7940 (fax: 206-685-3351; email: swilhelm@u.washington.edu).